One of the best books I read to help my writing was From the Inside Out: discover, create and publish the novel in you by Rachel Hauck and Susan May Warren. One of the many topics they cover are the different categories of romance plots that are out there. “Home Again, Home Again” is a popular plot device because it offers so much opportunity for conflict and romance. Think about it. How many books have you read where the heroine returns home and runs into the high school sweetheart that broke her heart? Perhaps she broke his when she left town? Maybe she had a crush on the popular athlete who never noticed her and her bookish ways until she returned for a high school reunion? 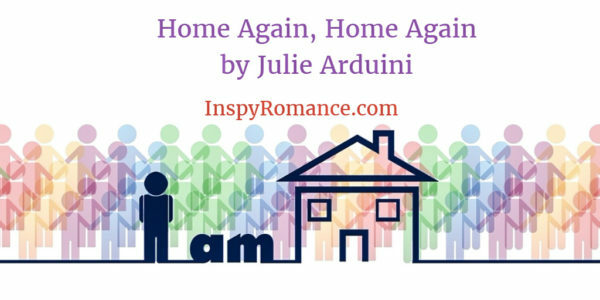 I love the various ways to write a home again scenario that jumps off the pages for readers. In my June release, ENGAGED: Surrendering the Future, Trish Maxwell was the “bad girl” in book 1, ENTRUSTED. She grew up in the Adirondack village of Speculator Falls and resented it. Her dreams had nothing to do with the county that boasts no traffic lights, her sights were set on New York City. She had an opportunity to pursue city life and took it, leaving everyone behind without a goodbye. Her departure was so abrupt that the senior center was briefly closed, angering many of them. When ENGAGED starts, Trish is back in town with egg on her face and a lot of apologies to make. The dream job was a nightmare and the Big Apple was a rotten experience for her. She’s back in Speculator Falls living with her parents. She has no career prospects and no friends. Her ex boyfriend, grocer Ben Regan, married the Ohio city-girl who became the new senior center director. Trish has to start over, and she’s got her work cut out for her. I thought I’d share an excerpt with you so you can get to know Trish better. Shirley McIwain and her huge specs enter the Speculator Falls Department Store right before closing. Nothing like a big pair of bug-eye glasses to magnify my troubles. She saunters down the main aisle, stopping to pick up the black bear figurines and to sniff a vanilla candle. From there, she walks up the slight slope that leads to the clothing section. Where the register is located. And I’m there pretending to read the weekly paper. Please don’t come over and ask me why I’m back in Speculator Falls. A line of perspiration slides down my back. She’s not wrong. But talk to Shirley? No thanks. I clench my hands together to control the sudden shakes. I try to swallow, but my throat catches as the perspiration continues down my backside. My eyes start to roll and my knees give out. A male voice, almost a whisper, is the first thing I hear before I even open my eyes. But the person I see, close up, is Shirley hovering over me. Those big pupils can really scare a person. “What’s going on?” I try to sit up, but my head collides with Shirley’s. A hand lands on my shoulder and presses me down to the floor. Shirley disappears, and kneeling before me is Wayne Peterson, Hamilton County paramedic. I didn’t know his eyes were Caribbean blue. “What happened?” Left on the floor, all I’m able to do is gaze into those ocean blues while he flashes a light between mine. Do you like the “home again, home again” theme in a romance? What has been your favorite title so far? To prepare for ENGAGED, I will be releasing book 1, ENTRUSTED, as an e-gift to newsletter subscribers this month. The Julie Arduini: Surrender Issues and Chocolate newsletter is a monthly update filled with recipes, freebies, book suggestions and more. Subscribe for free at juliearduini.com. My current WIP has a home again plot. As a writer, there are so many directions you can take this. Thanks for sharing the excerpt, Julie…I enjoyed it! Thank you, Jill! Home again is one of my favorites, too! Hi Julie, thanks for sharing the excerpt. I cannot think of a title at the moment, but I do enjoy the home again plot. I have some issues with home again stories when the main characters still love each other after so many years and after having changed. How can you love someone who changed and you don’t know the person anymore. It’s like loving who the person was and not who they are. Anyway, this is not the case with your stories which makes me interested to read. Thanks for sharing about your story. That’s interesting, Priscila! That would be fun to explore. Maybe the memories they had from the years, and as they get to know each other again, they fall back in love, more authentically this time? Hmmm, you have me thinking! I like falling in love again or falling in love with a friend you were not originally in love with.. but falling for the traits of someone who you acknowledged has changed makes little sense in a real world. Thanks for sharing your. Sounds very interesting. As an avid reader, I DO love the home again! Hard to pick a favorite though. Home again is fun to read—and write! Thanks for reading, Jackie! It can be a really fun trope to read and write! Thanks for sharing that fun excerpt. Poor Trish. Trish was a stinker in ENTRUSTED, so it’s been kind of fun to make things challenging for her. I love how God is weaving it together. It has been a fun one to write. I enjoyed the except. I enjoy the home again idea, but don’t have a favorite. Thanks for writing! God bless! Thanks for reading, Diana! Blessings to you, too! Thanks for sharing. I am now a newsletter subscriber! Linda, thank you for reading and for subscribing. I hope to have a newsletter out this week. So I tried to go to your webpage and it keeps giving me an error message. I love reading a new author for me so want to get your newsletter. What is the actual link or webpage? Thanks so much. Hi, Judy! Thank you for letting me know. I applied some updates on my site and something did not “take.” My husband is my tech guy and he’s been on a project, so I hope to grab him tonight and have him get my site back on. Once it is, you should find it on the right sidebar. If not, let me know at juliearduini@juliearduini.com and I can manually add you to the newsletter. The new issue will be out Memorial Day weekend. I loved the excerpt. I can totally picture what it would be like to have Shirley hovering around. Home again plots aren’t always my favorite but it really depends on the story. Jessica, thank you for reading. I hope you will check out ENGAGED when it comes out, as well as the first two books, ENTRUSTED and ENTANGLED. They are not home again themed, but a lot of fun to write. Have a great weekend!